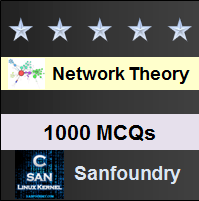 This set of Network Theory Multiple Choice Questions & Answers (MCQs) focuses on “Voltage and Current Sources”. Explanation: Energy sources(voltage or current sources) are active elements, capable of delivering power to some external device. Explanation: If the voltage source is to be neglected, it can be replaced simply by means of a wire i.e, it should be short circuited. Explanation: A practical voltage source can be represented with a resistance in series with the source. Hence, there would be some voltage drop at the resistor and the terminal voltage is always lower than the source emf. Explanation: For the ideal current sources, the current is completely independent of voltage and it has infinte internal resistance. Explanation: Even on changing the values of linear resistors, the voltage remains constant in case of ideal voltage source. Explanation: A practical current source could be represented with a resistor in parallel with an ideal current source. Explanation: A practical voltage source could be represented with a resistor in series with an ideal voltage source. Explanation: Voltage source is an active element and is unilateral. 9. Which of the following is true about an ideal voltage source? Explanation: An ideal voltage source zero internal resistance. Explanation: Dependent sources can either be current sources or voltage sources. Explanation: At t=0+, the capacitor starts charging to a particular voltage and acts as a voltage source. Explanation: As the ideal current source has infinite resistance, it can be neglected by open circuiting the terminals. Explanation: From Ohm’s law, resistance is inversely proportional to the current. Explanation: A voltage source with resistance in series can be replaced with a current source with the resistance in parallel.